Two weeks ago Louisville was aglow with parties, bands, parades, fireworks and bourbon as hundreds of thousands of people gathered here to celebrate the 139th running of the Kentucky Derby. As Kentucky-bred Orb made a stunning comeback to cross the finish line, however, the mood of the city was about to change, dramatically, as a conference titled "Sacred Silence: Pathway to Compassion" convened in the historic Cathedral of the Assumption. This five-day event, the 19th annual Festival of Faiths, is an impressive prelude to the visit beginning Sunday of His Holiness the Dalai Lama, who is making his third trip to Louisville. It's not bourbon and thoroughbreds that the Tibetan spiritual leader is coming to celebrate. Rather, it's designation of Louisville as the "International Compassionate City," a distinction achieved in 2012 in large part because of the leadership of Greg Fischer, the city's 50th mayor. In his inaugural address in 2011, Fischer declared that his three priorities would be "education, health and compassion." More than a few scoffed at the third goal, predicting that compassion would soon be ditched in the crush of old-fashioned power politics. How wrong they were. In November 2011, the city council passed and the mayor signed a resolution committing to a multi-year Compassionate Louisville campaign. In doing so, Louisville (pop. 750,000) became the largest American city to make such a commitment, affiliating it with the list of principles developed by British writer Karen Armstrong, who issued the Charter for Compassion in a TED talk six years ago. 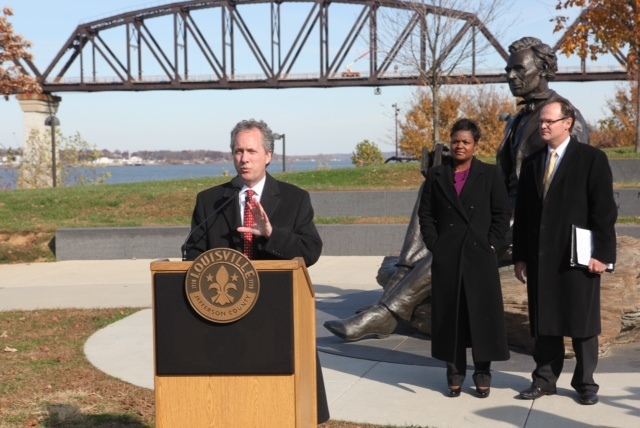 It was fitting that Mayor Fischer signed the charter at the Abraham Lincoln memorial in Louisville, which was designed by local sculptor Ed Hamilton. "Being a compassionate city is both the right thing and the necessary thing to do to ensure that we take care of all of our citizens. There's a role for all of us in making sure no one is left behind or goes wanting," he mayor has explained. The range of activities that has resulted can be explored at this website. The mayor, whose father was a founder of an organization now known as the Center for Interfaith Relations, approached that group to ask if it would consider rescheduling its annual Festival of Faiths from the normal November dates to May -- in preparation for the May 19-21 visit of the Dalai Lama. The idea was enthusiastically greeted by Louisville philanthropist and spiritual leader Christina Lee Brown, who conceived of the Festival in the mid-1990s and has been its driving force ever since. Her son, Owsley Brown III, agreed to serve as chairman of the event, and Mayor Fisher is honorary co-chairman. At an Interfaith service Tuesday at the Cathedral of the Assumption, Owsley Brown explained it was his lifelong interest in Kentucky's "adopted son," Thomas Merton (1915-1968), that sparked a devotion to spirituality. Merton, the Trappist monk who was based at the Abbey of Gethsemani, 50 miles south of Louisville, was internationally admired for his efforts on behalf of peace and interfaith understanding. He died in Bangkok, shortly after a historic meeting with the Dalai Lama. Louisville's Bellarmine University is the home of the Thomas Merton Center, which draws pilgrims from around the world to see the papers and other artifacts of the great theologian. Brown explained the importance of that meeting, the 45th anniversary of which is also being commemorated this week in Louisville. It "will forever be remembered as an outstanding example of two individuals from differing religious and cultural backgrounds finding spiritual kinship." "It is interesting to note that the long-shared interfaith conviction that compassion is the foundation of happiness or liberation is now confirmed empirically through scientific investigation, extending the case for silence and compassion to secular society as well as religious. Given the notable findings of a host of scientific researchers, we can no longer speak authoritatively of compassion without reference to what genetics, psychology, neuroscience and many other disciplines have discovered about it. At this point in our history, the interaction of the sacred and the secular is essential." With daily meditation practice sessions, challenging lectures and panel discussions and vigorous conversations over lunch and dinner, hundreds of Festival of Faiths participants are engaging not only in silence, but also in the interpretation of what it means to lead a compassionate life. Louisville's growing reputation for religious understanding -- which will be internationally recognized by the Dalai Lama's visit Sunday -- is sending a message across America. Mayor Greg Fischer signing the resolution making Louisville America's largest "compassionate city." The ceremony was in November 2011 at the city's Lincoln Memorial, designed by local sculptor Ed Hamilton. To learn more about the Festival of Faiths, visit its website. Most of the Festival events are being streamed on YouTube.